Barcelona remain unbeaten at the top of La Liga after being held to an entertaining draw by Celta Vigo. Iago Aspas put Celta ahead after Marc-Andre ter Stegen parried Maxi Gomez's shot, but Barca levelled moments later as Lionel Messi converted Paulinho's pass for his 17th goal this season. Luis Suarez had a goal harshly ruled out for offside and Messi hit a post. Suarez put Barca ahead from Jordi Alba's cross after a Messi pass, but Gomez equalised from Aspas' cutback. Barca defender Samuel Umtiti pulled up with a hamstring injury while chasing Aspas for that goal, and has been ruled out for eight weeks. The Catalan side are five points above Valencia, who visit Getafe on Sunday. Celta Vigo - who move up to eighth - were good value for their draw, with a positive attacking attitude. Aspas, in particular was excellent. Barcelona did have chances to win an open game, and Messi, La Liga's top scorer with 13 goals in 14 games, headed wide from four yards out. Atletico Madrid are a point behind Valencia, having come from behind to beat Real Sociedad 2-1. Willian Jose put La Real ahead with a penalty, but Filipe Luis equalised before Antoine Griezmann's 88th-minute winner. Sevilla beat Deportivo La Coruna 2-0 and Real Madrid drew 0-0 at Athletic Bilbao in Saturday's evening game. Match ends, Barcelona 2, Celta de Vigo 2. Second Half ends, Barcelona 2, Celta de Vigo 2. Corner, Barcelona. Conceded by Andreu Fontàs. Attempt missed. Paco Alcácer (Barcelona) header from the centre of the box is too high. Assisted by Sergi Roberto with a cross. Corner, Celta de Vigo. Conceded by Thomas Vermaelen. Pione Sisto (Celta de Vigo) is shown the yellow card. Daniel Wass (Celta de Vigo) is shown the yellow card for a bad foul. Attempt saved. Pione Sisto (Celta de Vigo) left footed shot from the left side of the box is saved in the centre of the goal. Assisted by Iago Aspas. Rubén Blanco (Celta de Vigo) is shown the yellow card. Attempt missed. Lionel Messi (Barcelona) header from very close range is close, but misses to the right. Attempt blocked. Denis Suárez (Barcelona) right footed shot from the centre of the box is blocked. Assisted by Luis Suárez. Substitution, Celta de Vigo. Pablo Hernández replaces Jozabed Sánchez. Denis Suárez (Barcelona) wins a free kick in the defensive half. Substitution, Barcelona. Paco Alcácer replaces Ivan Rakitic. Delay in match Gustavo Cabral (Celta de Vigo) because of an injury. Foul by Denis Suárez (Barcelona). Attempt missed. Hugo Mallo (Celta de Vigo) right footed shot from outside the box is too high. Assisted by Iago Aspas. Gerard Piqué (Barcelona) hits the right post with a right footed shot from the right side of the six yard box. Assisted by Lionel Messi following a set piece situation. Facundo Roncaglia (Celta de Vigo) is shown the yellow card for a bad foul. Foul by Facundo Roncaglia (Celta de Vigo). Attempt missed. Paulinho (Barcelona) right footed shot from the centre of the box is just a bit too high. Substitution, Barcelona. Thomas Vermaelen replaces Samuel Umtiti because of an injury. Goal! 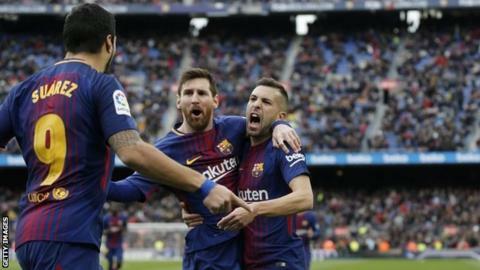 Barcelona 2, Celta de Vigo 2. Maxi Gómez (Celta de Vigo) right footed shot from the centre of the box to the bottom left corner. Assisted by Iago Aspas.